What Is The Best Metal For Nose Piercings? Thinking of getting your nose pierced? Perhaps you already have a piercing but you’re interested in learning more about nose ring metals? Here’s the thing, piercings are generally safe and stylish, but metals run the gamut from high-quality and safe, to flat out painful health risks. It’s important to learn the best and worst metals for nose rings, so that you can make an informed and safe decision. Are nose rings all the rage? Yep. In fact, approximately 19 percent of U.S. women and 15 percent of U.S. men have their nose pierced. 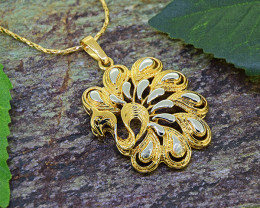 As with any jewelry items, there are health factors to consider. Namely, there are two important things to consider when getting a nose piercing: allergic reactions and infections. Metals can irritate your skin if they’re not biocompatible, meaning the metals are not harmful or toxic to the skin. Conversely, metals that are not biocompatible are harmful and can result in infection or irritation. To minimize the chances, it’s important to know what the best metals for nose rings are. Here’s a comprehensive overview of the nose ring metals. First, let’s explore the best and safest metals for piercings, then we’ll talk about which metals to avoid. There are a variety of different nose ring metals, let’s have a look at the best and most popular options. Titanium is a popular metal that lends itself to a variety of uses. In jewelry, titanium is popularly used for men’s wedding rings and body piercings. Before you decide on a titanium nose ring, you must first ensure that the metal is implant certified titanium. Titanium alone is not biocompatible, so you’ll want to buy implant certified titanium or an implant-grade titanium G23 nose ring. There are several reasons why titanium nose rings are popular. Titanium is durable, lightweight, scratch-resistant and timeless. The only real drawback to titanium nose rings is that they can be pricey. That said, it’s an important investment to avoid infection and have a metal that’s durable, safe and long-lasting. The most popular type of nose ring metal is surgical stainless steel. The reason it’s the most popular is because it’s hypoallergenic, affordable and is a safe metal for healing from a fresh nose piercing. There are a variety of surgical stainless steels available, however the ones used in fresh piercings are 316 LVM, or 316L. Both of these types of stainless steel are implant grade metals. That said, those with nickel sensitivity should take care as stainless steel contains a small amount of nickel. Otherwise, a surgical stainless steel nose ring is a safe and affordable choice. Niobium is another one of the safest metals for piercings. It’s softer and heavier than titanium, and actually isn’t a metal but an element. Typically, niobium is a great starter nose ring for fresh piercings. While it isn’t as popular as titanium or surgical stainless steel, niobium is a solid alternative for those with metal sensitivities as it’s hypoallergenic and biocompatible. Gold is a classic jewelry staple and it’s incredibly popular for nose rings. Gold is pure, timeless, natural, hypoallergenic and overall a safe and stylish nose ring metal. To ensure your gold nose ring is pure gold, opt for 14k or 18k. There are also copper alloys available, which still contain gold but the copper helps strengthen this naturally soft metal. 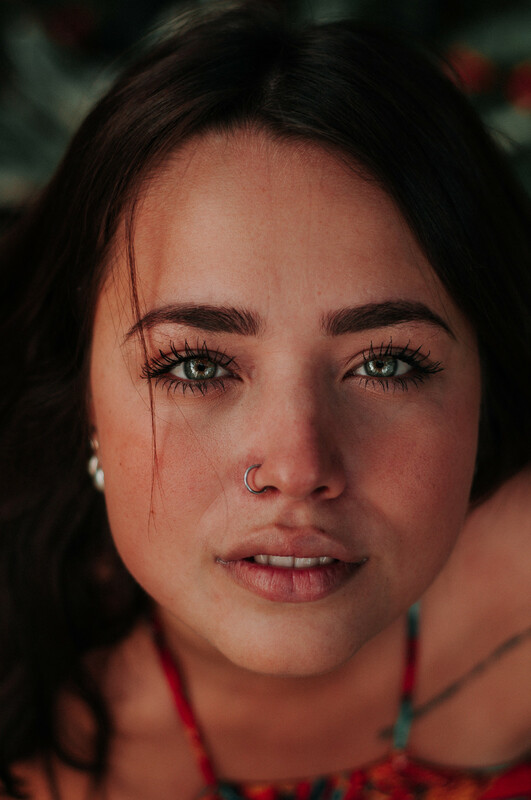 While pure gold is a great choice for nose piercings, gold-plated nose rings can cause infections and allergic reactions. Which leads us to our next point: what are the worst nose ring metals? Which Metals to Avoid and Why? 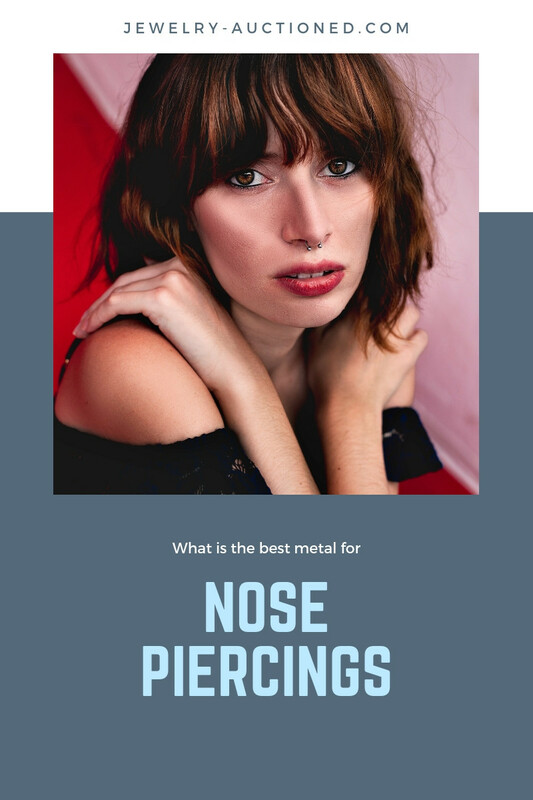 We’ve explored the best metals, now let’s take a look at which metals to avoid and why they’re unsafe metals for nose rings. Both of these materials are soft and brittle, meaning they’re difficult to clean and prone to falling out. Worse, they’re permeable; like a sponge they absorb fluids which promote the growth of bacteria. What does bacteria breed? Infection. Lastly, they’re sticky which can be highly uncomfortable. As you can see, plastic and nylon are some of the worst metals for nose rings. If you’re looking for the best nose rings that don’t fall out, avoid plastic and nylon. Sterling silver has other alloy metals in it that might interfere with the healing process of a fresh nose piercing. 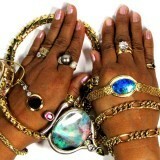 Furthermore, silver tarnishes when mixed with natural fluids like sweat, which can actually stain the skin permanently. This happens because the silver oxidizes, turning the metal black and the skin along with it. While sterling silver is hypoallergenic and great for other non-piercing jewelry pieces, it’s not a good metal for a fresh nose ring. That said, after the piercing has fully healed sterling silver can be used. While we certainly recommend wearing a gold nose ring, we can’t say the same for gold-plated nose rings. Actually, any plated metals are a no-go. Why? 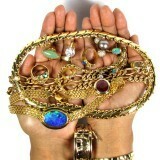 Well, these metals are plated with gold, which ultimately wears off. When the plating flakes off onto the skin it can result in irritation and even stimulate allergic reactions. Plated metals also discolor and are not built to last. So, what kinds of plated metals might you come across when browsing different nose ring metals? 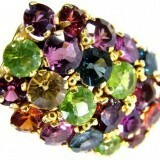 You’ll encounter vermeil, gold-filled, gold-plated or rolled nose rings. Plated metals have a base metal of either zinc, nickel or copper. Each of these base metals are prone to irritate the skin and cause allergic reactions. Simply put, plated metals are not a good nose ring option. There you have it! Now that we’ve explored each of the different types of nose rings, you know which ones are safe and which to avoid. To recap: ensure that your nose ring metal is hypoallergenic, biocompatible, durable and not plated. With these factors in mind, the most popular, safest and best nose ring metals are titanium, gold, surgical stainless steel, and niobium. Which one will you choose? It depends entirely on your style and preference, but with either of these nose ring metals, you can rest easy knowing your skin is safe.